Something strange is going on in a distant corner of our universe. About a dozen supermassive black holes are all shooting enormous jets of energy in roughly the same direction. It could be a cosmic coincidence — but some astronomers suspect there are larger forces at play. 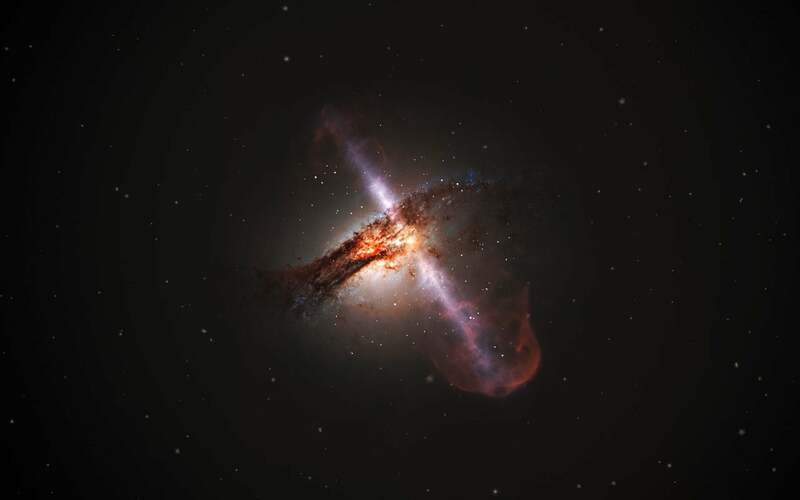 Supermassive black holes, which are found at the centre of nearly all galaxies, periodically erupt, hurling streams of energised plasma into intergalactic space. For instance, our galaxy's own supermassive black hole, Sagittarius A*, will sometimes swallow a star and belch X-ray energy all over the Milky Way. These eruptions are fascinating to astronomers, but they are typically thought to be independent events. Now, a survey of 64 galaxies located halfway across the known universe has revealed a bizarre alignment between the energy jets erupting from a handful of black holes, all of which are located within a hundred million light years of each other. A pattern like this shouldn't exist, unless it's being dictated by an even larger structure in our universe. Which is exactly what Russ Taylor, lead author of a forthcoming study in the Monthly Notices of the Royal Astronomical Society, thinks may be happening. As Science News reports, Taylor suspects the eruptions are all being steered by filaments, a sort of scaffolding along which matter congregates on a cosmic scale. If the hypothesis is correct, it could help explain how our universe's present structure came to be. Not everybody is convinced, however. Some astronomers feel the number of galaxies in the study is too small to draw meaningful conclusions, and that the pattern could be chalked up to nothing more than chance. But the idea of a cosmic alignment is intriguing enough that Taylor and his colleagues plan to follow up on it by probing more black holes, and by figuring out the precise distances between the galaxies they have already studied. I suppose if there's one takeaway for us puny Earthlings, it's that there are mind-bogglingly vast forces shaping our universe in ways we've only just begun to understand. Keeps your post-long-weekend struggle in perspective.